Are you new to skiing or snowboarding? Perfect, our world-class instructors will teach you the basics so you can experience the fun of making your first ever turn and help you improve your skills at a relaxed pace. 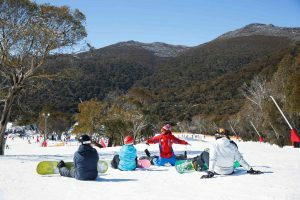 This first timer lift and lesson product is only offered for one day as you’ll master the basics of skiing or snowboarding and move on to the more advanced areas of the mountain. Learn how your equipment works. Gain the confidence and master the basics of skiing or snowboarding on our purpose built beginner area, Friday Flat. Learn to ride the lifts. Meeting Place: First timer flag at Friday Flat. All lessons must meet 15 minutes prior to lesson start time. Lift access is activated once pass holder has participated in a lesson. Lift access is limited to Friday Flat only. This includes the following lifts: Easy Does It Quad, The Burrow, Syd’s Snow Runner and Snow Runner #2.